My name is Pamela Jones. I live in a converted chapel lost in the Welsh rolling hillside, running classes for people of all ages and abilities who'd love to learn to paint.. I teach painting techniques in water colour and mixed media. I am a qualified tutor and I design and run classes online and in my studio in the heart of Wales. Two for One introduction to Watercolour painting. 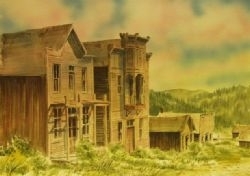 * Learn 2 Paint in the comfort of you own home. * Online, email or video (skype) or telephone support. * Buy one classes @£10 get the 2nd one FREE. * Guide to purchasing brushes, paints and materials you will require to proceed. * On completion a certificate validating your achievements. I am certain you will find painting as enjoyable as I do and should you choose to continue your new found hobby.. I can offer other beginners and advanced courses for you to join. These are very reasonably priced and certificated by Pammy. Completed online or at Pammy's studio. Click here to return to International arts workshops . Live and work this summer in a 12th century town. In the heart of Umbria, halfway up the slopes of Mount Subasio, lies Assisi. Its medieval character has been maintained and can still be discovered in its narrow streets and squares. In this special environment, Art Workshop International offers a series of related courses to make your sojourn in Assisi an unforgettable experience. Classes, lodging, and meals are in a beautifully situated hotel overlooking the Umbrian plain. Art Workshop International celebrates its 30th year in Italy. 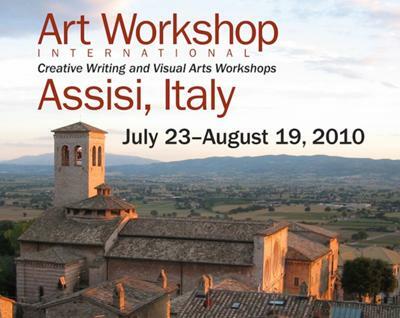 Under the direction of Bea Kreloff and Edith Isaac-Rose, artists and writers are invited to Assisi to join the Art Workshop International summer community. Besides Frank McCourt, past visiting artists have included Maxine Hong-Kingston, Dorothy Allison, Tony Kushner, Michael Cunningham and Grace Paley. Classes are five days a week with two days off for short-term travel. Participants are encouraged to stay on for another class or spend an extra week in Assisi to continue their study/relaxation independently. Painting workshops and art courses for all levels of ability in watercolor, oil, acrylic, pastel, pen and ink, drawing and mixed media. Class size Maximum 10. I can teach to your schedule. I charge $35.00 per hour minimum of 8 hours and also charge mileage at .40 per mile plus lodging.